It’s an honor to be a featured artist in this exciting exhibition which highlights the past and present work of Monroe County Grant Recipients of the prestigious South Florida Cultural Consortium Award!! Winning this award in 2001 validated and I am eternally grateful to the SFCC for their recognition of my work at such an early stage of my career! It is a privilege to call many of these artists FRIENDS as well as INSPIRATIONS for my creative practice. Scroll down to find more information about this fantastic exhibit as well as a list of participating artists with links to their personal websites.The opening reception is TONIGHT from 5-7pm at the Gato Building in Key West. 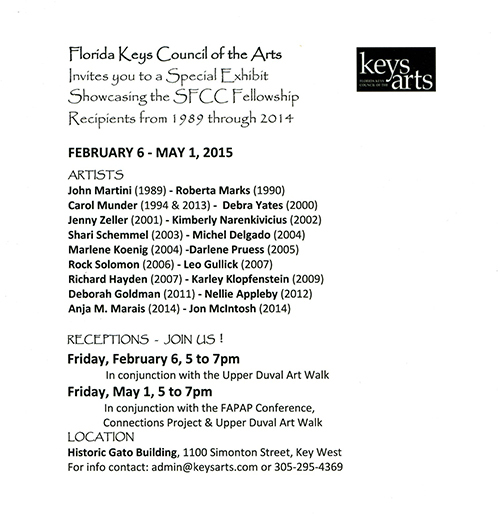 This exhibition will be on display through May 1st, 2015 and is curated and sponsored by the Florida Keys Council of the Arts.